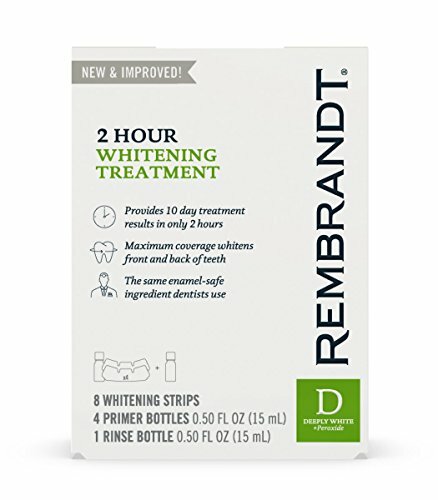 The Rembrandt 2 Hour Teeth Whitening Treatment provides 10 day treatment results in only 2 hours! With newly designed Stay Put custom-fit whitening strips, you get maximum coverage on the front and back of your teeth for a visibly whiter smile. The 2 Hour Whitening Treatment consists of 4 consecutive 30-minute treatments of the primer and whitening strips, followed by the whitening rinse. This unique teeth whitening kit offers a speed-to-white experience without sacrificing efficacy, and uses the same enamel-safe ingredients that dentists use. Care for the smile you love with Rembrandt! If you have any questions about this product by Rembrandt, contact us by completing and submitting the form below. If you are looking for a specif part number, please include it with your message.